The dedication of the Grant Street Airport in September of 1928 provided the occasion for the first Corvallis air show. The air Derby featured several races, aerobatic stunts, parachute jumps, and rides offered by, among others, Edith Foltz, the first woman licensed pilot in Oregon. In 1928, the event also included Army and Navy planes flying in formation and mock combat. 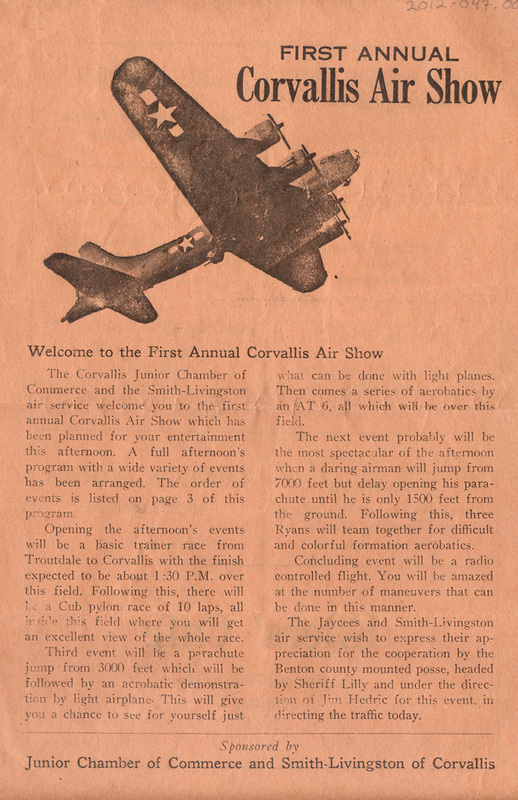 From 1946 to 1948, the Corvallis Junior Chamber of Commerce (Jaycees) brought air shows back to Corvallis. This program for the 1946 show lists the events: air races, navy and marine demonstrations of formation fling, parachute jumps, and aerial acrobatics. West Coast Airlines demonstrated a DC-3 flying with one engine shut down. Various planes were also on display.